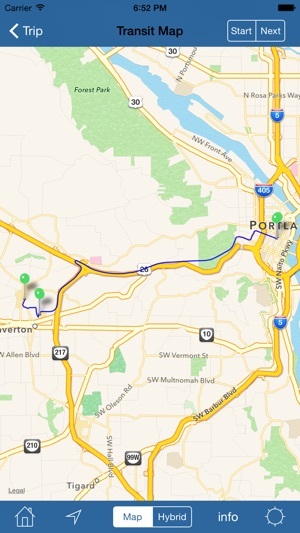 PDX Bus is an award winning application that displays arrival times for public transport in Portland, Oregon. This app uses the Internet to quickly access TriMet's live tracking data to display arrival times perfectly formatted for the iPhone. It allows you to bookmark frequently used stops, displays recently accessed stops, and gives details for arrivals which are en-route. You can enter the stop "id" of the stop (as displayed at each stop or station) or you can browse the routes for the stop. - Interactive rail maps, showing the MAX, WES and Streetcar stops. - Embedded maps, showing locations of stops, and when available, the last known position of the bus or train. - Use GPS to locate nearby stops or rail stations. - Browse routes and stops, show an entire route on the map. - Links to TriMet route information. - Displays Rider Alerts, and Detours. - A "Nighttime visibility flasher" - a flashing screen that can be used at night so that drivers can see you. TriMet suggests holding up a cell phone to make yourself visible to bus drivers. 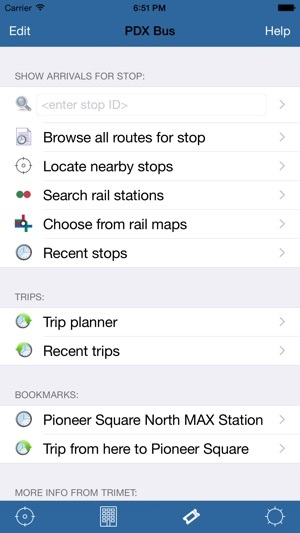 -Trip Planning - now you can use the same trip planning feature that is available on TriMet's web site. - Specially formatted text to work with the iPhone 3GS VoiceOver accessibility feature to speak arrivals. Route and arrival data provided by permission of TriMet. Note: this free application was developed as a volunteer effort to provide a service for TriMet riders, the developer has no affiliation with TriMet, or Apple. Suggestions and feedback are welcome. - iOS 12 Siri Shortcuts: Use the "Add this stop to Siri" menu item to associate a stop with a phrase for Siri, and Siri will say and show all the arrivals for a single stop. - iOS 12 Siri Shortcuts: Use the "Add to Siri to launch with bookmark" menu item to associate a bookmark with a phrase for Siri, who will launch PDX Bus and show the bookmark. Siri won't attempt to read all the arrivals in this case, as there could be a lot as each bookmark can have many stops. - iOS 12 Siri Shortcuts: Use the "Add to Siri" menu item on the locate screen to set up a phrase to launch the app and locate nearby arrivals, routes or show a map. - WatchOS 5 Siri Shortcuts: Support for some Siri shortcuts on the watch app (trip planning is not supported from the watch). - WatchOS: Added complications support to launch watch app from a watch face. - iOS: Detours are shown for stops without arrivals. - All: : Bug fixes; modernized memory management. I found a place that can cause a hang; this was probably the real cause of the issue when getting routes. - iOS: Fonts. Now displays the time in larger text when the arrival time is more than an hour away. Uses Verdana where there are changing numbers - this looks better as the numbers are fixed width. Fixed text alignment issues. - All: Now displays the day of the week if arrival time is more than 12 hours away, instead of the date. I use this app multiple times each day during the work week. I really liked the flashing light to alert bus drivers during the winter time but it seemed to have disappeared. I read some reviews today and the latest app description and realized that it wasn't gone but just "hidden" in the optional settings that I never thought to review! I also found the ability to bookmark my stops which is very handy since I previously had a note on my phone with all my favorite stop ID's. I really do find the app to be helpful and pretty accurate. I hope that your able to implement it (because the current way to access vehicle numbers are very hard to find), but again, very easy to implement. Thanks! I added this feature in version 11.0, released last week! 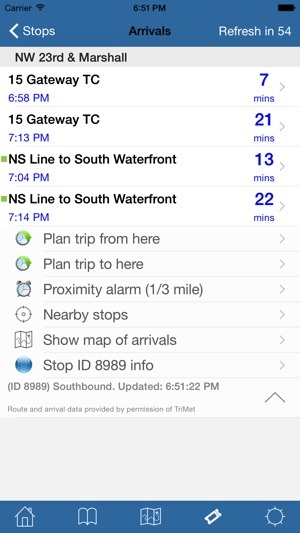 :-) the app now uses the new data feed from TriMet which has this data. Other crummy public transit systems have great apps (ex CapMetro in Austin). Wish Trimet app would be brought up to modern mobile standards. Maybe more people would ride. For example, the “map” functions are primitive. Cannot search by business name—must know street address. The trip planner results screen is very cumbersome on iphone screen. Lots of paging through irrelevant info. Good apps display all optional trips on first page with drill downs to details. If streetcar is part of system would be nice to have it integrated. Maybe Trimet should buy the now defunct Transit Times app to get an idea of a decent functional app.